Blick Art Materials' Grand Opening in Brooklyn, featuring NYHC artists! NY Handmade Collective joined Blick at their Flatbush store's grand opening, which kicked off Thursday, November 15, and continued through the weekend. Doorbusters, giveaways, and live music were on deck, as well as Saturday's special highlight on local artists featuring demonstrations by eight NY Handmade Collective artists. 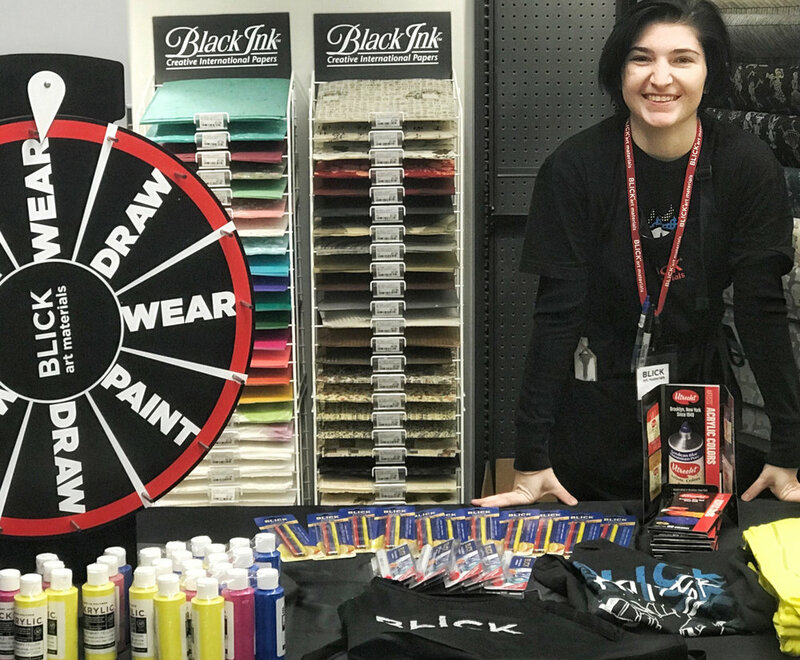 Blick has long been a go-to store for professional artists, students, and beginners, and their newest Brooklyn store at 41 Flatbush Avenue, which opened this fall, is no exception. Saturday's demos ranged from mixed media art to pen and ink, including a Speedball block printing demo with our own Neena Litton, fashion illustration with Strathmore pads and Copic markers by Joanna Baker, calligraphy using Canson pads by Danielle Rothman, and much more. Sunday put the spotlight on kids, with a kid-friendly paint pouring workshop, face painting, a ProjectArt children's demo, and prize wheel giveaways. The new store features local and associate artists throughout the space, including work by crochet artist London Kaye, paintings by Danielle Mastrion, and a mural by artist/designer Efdot behind the cashwrap. Shop an expanded range of products, experience in-store demos, and try new techniques and projects at the newest Blick Brooklyn store. Thanks again Blick! We couldn’t produce our Handmade Cavalcade without amazing sponsors like you!